I’ve not been able to get out with the camera for a while and I missed my “photo Friday” entirely this week due to miserable rain. This evening, however, a break in the clouds and precipitation gave a glimpse of what was responsible: a towering cloud was building above scudding dark remnants, set against a sharp blue sky. I found an open spot and, with my little PowerShot G11, captured what I could of the scene. In the space of about 10 minutes, the boiling dome of cloud billowed upwards. As it exploded upward, the white cloud was sculpted by high winds cutting grooves in the tower and rolling filaments into streamers off to the north. 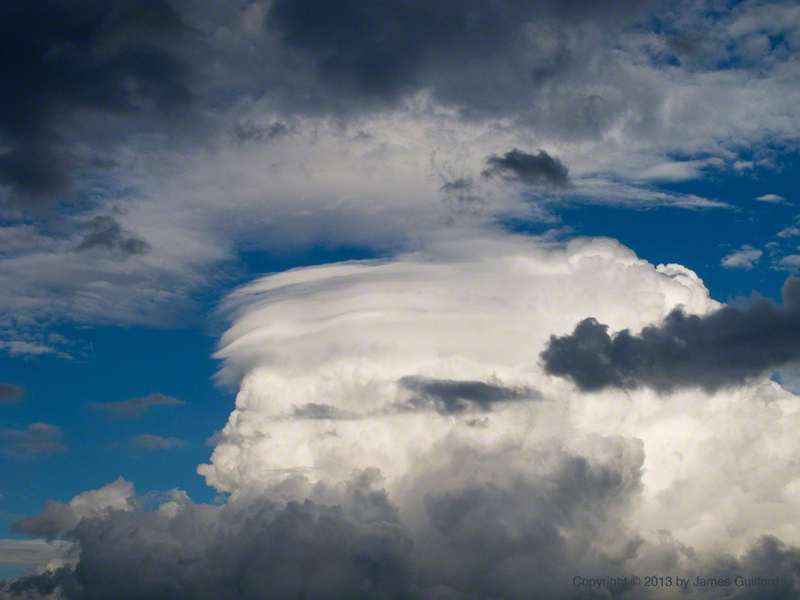 It wasn’t long before the building storm cloud was hidden by much lower, less interesting layers. It was a fine few minutes spent watching nature sculpt water vapor.